When we told this baker that we’d chosen her cake as our “cake of the month” for January she was super happy because, she said, she never wins anything! The thing is though, as cheesy as this may sound, it’s the child who received this cake, not her, who is the real winner. We know, we know, that is Cheddar overload, with a side helping of brie, but it’s true. PS: How do you get a mouse to smile? Say cheese! When all mixed together divide between two tins and bake at 160 fan or 180 for 30 minutes or thereabouts. Whilst baking, make the buttercream by mixing all ingredients together. Remove cakes from oven and leave to cool on a rack. When cool, put a third of the butter cream on one cake, jam on the other and sandwich together. Spread the rest of the buttercream on the cake. 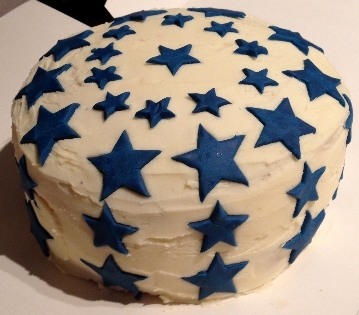 Decorate with stars cut out from the coloured icing. Eat (unless you’re providing it as a gift, then don’t eat). If you like you can dye one cake layer a different colour by dying half the batter in a separate bowl. Please note you probably need more dye than you think otherwise it can come out looking a bit grey and sad. Then when it comes to icing, split both cakes into two then alternate them so it’s stripey inside. But you don’t have to. It’s merely a suggestion. I am a DJ and performer and live in Dalston. I enjoy baking, but don’t do it a lot as I live in a household of one and would end up eating cake for every meal so I tend not to. Even though I would like to. I bake for FCFK Hackney as it’s a great idea and is more personal than making a charity donation. Plus it’s great fun and satisfies my baking urges without compromising my thighs.